Starch grains: Fourteen stone tools from Operation V, a single residential architecture complex and its associated domestic trash deposits, were analyzed for evidence of starch grains and phytoliths. They included stone flakes, cores, hand-held grinding stones, and a hammer stone. Of these, nine were positive for maize starch, one was positive for phytoliths, and two were positive for both. Two additional stone tools had no identified maize remains but were positive for other plants, (Haas et al. 2013: Table S3). 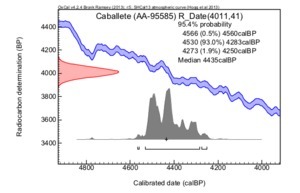 Haas and colleagues were able to date 27 radiocarbon samples from this operation and their median ages ranged between 4435 and 4040 cal. B.P. (Haas et al. 2013:4, Table S1). For the purposes of mapping the temporal distribution of maize starch represented by these stone tools and the associated radiocarbon samples, we will include the oldest date from Operation V, Unit 17, I19, Feature 106: AA-95585. 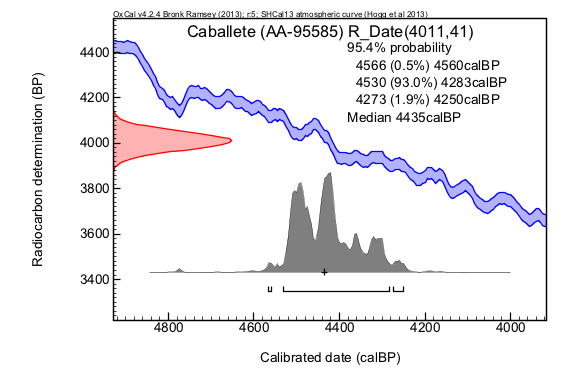 2013 Evidence for Maize (Zea mays) in the Late Archaic (3000-1800 B.C.) in the Norte Chico Region of Peru. PNAS Early Edition:1-5.